Devourer of books with a preference for fiction. Quite good at competitive reading. Happily hoards books of all kinds. Gets stabby going too long without reading. After their father dies and leaves pretty much everything to their older half-brother, the three Misses Dashwood and their widowed mother have to find a new place to live, which isn't exactly easy with the meagre income they have. After some searching, a cousin of Mrs. Dashwood's offer them lodging in a little cottage on his estate in Devon. The eldest daughter, Elinor, admonishes them to make the best of it, but the middle sister, Marianne, is determined to be miserable. Then she meets the dashing John Willoughby, and Devon suddenly becomes the only place in the world she wishes to be. Elinor too has a prospective suitor, Edward Ferrars, the eldest brother of her sister-in-law, but he seems most reluctant to declare himself before they leave for Devon and she comes to believe that she may have misread the situation entirely. Elinor worries about Marianne's behaviour with Willoughby and how heedlessly she throws herself into her infatuation. When he suddenly has to leave Devon, without any good explanation, she fears the worst for Marianne. The kind, yet frivolous Mrs. Jennings invites the eldest Dashwood girls to come to London with her, and Marianne is delighted, as it means she may be reunited with Willoughby. Elinor, on the other hand, having learned why Edward never made any real advances towards her and seemed so reticent, dreads going, because it means the possibility of having to see him and interact with a man she can likely never have. 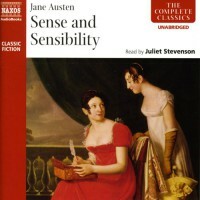 Sense and Sensibility was the first novel Jane Austen ever published, anonymously as "A Lady". The Dashwood sisters experience loss, reduced finances, love, heartbreak and eventually happiness over the course of the novel. It was the second Austen I ever read, but unlike Pride and Prejudice and Emma, I had never re-read it as an adult woman. Obviously, one's perspective changes quite a lot in twenty years. I remember liking it a lot as a teenager (I read it during a skiing vacation with my family in the mountains, and seem to recall being told to put the book away more than once, so I could join the family in card games, rather than "being so anti-social" - story of my life), but I doubt I found Marianne quite so unbearable as I did now. Seriously, Marianne's drama-queen behaviour in this book almost ruined my enjoyment of the book. After some fairly considerable heartbreak and a life-threatening illness, she finally starts to see how self-centred and oblivious she's been, but to me, it was almost a case of too little, too late. Elinor Dashwood more than makes up for her younger sister's impetuous and frustrating behaviour though, being a stoic and sensible rock no matter what horrible things befall her and her family. Forced to balance out not just her overly emotional sister, but on occasion her grieving mother as well, Elinor is almost superhumanly competent. In the absolutely amazing Ang Lee movie version from 1995, starring Emma Thompson and Kate Winslett, Elinor gets a proper emotional breakdown in one scene, which never fails to bring me to tears. Being an absolutely champion, she doesn't let it affect her for long, but picks herself up and goes on being the most capable you could imagine. In the book, the outburst is much less violent, which makes it feel as if Elinor bottles her emotions just a little bit too much than is entirely healthy. Thompson, who wrote the screenplay for the movie, allowing Elinor a proper venting of her feelings, makes the character more human and relatable. Much as I like this book and the lovely Elinor, Pride and Prejudice will always be my favourite. Nor do I think I can ever extricate the story from the movie version either, they are just so perfectly matched in my mind. While I was ill recently, I watched the film while in bed, probably more affected than ever before, because of the sad recent loss of Alan Rickman, who portrays Colonel Brandon so wonderfully. With him as my constant mental image of Brandon, it makes Marianne's continued failure to see his greatness even more baffling. I had also completely forgotten how many loathsome characters there are in this book. Really, the list is long. The girls' brother, John Dashwood, his horrid harpy of a wife, Fanny Dashwood. Her brother Robert Ferrars. Lucy Steele, and to a certain extent her sister (whose name escapes me). Willougby's aunt, although as the story progresses, her actions may be understandable. Mrs. Jennings is quite frustrating on occasion, but not really as bad as the others, and mostly, she means well and does what she can for the young ladies. She can't help being very silly, any more than Mrs. Bennett can. I seem to have repressed the number of awful people who make the Dashwood womens' lives more difficult. At least, with this being a romance, it all turns out happily in the end. Finally, I just want to note that I listened to this in audiobook, and Juliet Stevenson does an excellent job with the narration. She has a very arch accent that fits the story very well. I can highly recommend it as a listening experience.